This article reviews and describes the theoretical concept of organ donation (OD) and transplantation, historical milestones, need, shortage, status of global activities, health system capacity, survival outcome, and update on legislative environment in India, Central/State contribution and Nongovernment Organizations actively involved in OD. Worldwide, kidneys are the most commonly transplanted solid organs followed by liver and then heart. Cornea and musculoskeletal grafts are the most commonly transplanted tissues; these outnumber organ transplants by more than tenfold. Nobody knows the actual need of people requiring an organ transplant. Since the untreated patients die and are not to be found in the hospital statistics or registries. The patients who die untreated may not be seen by specialist physicians or may never be admitted to a hospital; they may, in fact, never be diagnosed or ever be seen by a doctor in many countries. In advanced Western economies, however, death certificate records are one way of assessing the causes of death of the population, and while they have their weaknesses, these records can provide reasonable estimates of need. No country in the world till date collects sufficient organs to meet the needs of their citizens. Spain, Austria, Croatia, USA, Norway, Portugal, Belgium, and France stand out as countries with high rates of deceased organ donors. OD is popularly reflected as per million population (pmp) and OD across the world is shown in [Figure 1] (deceased OD). 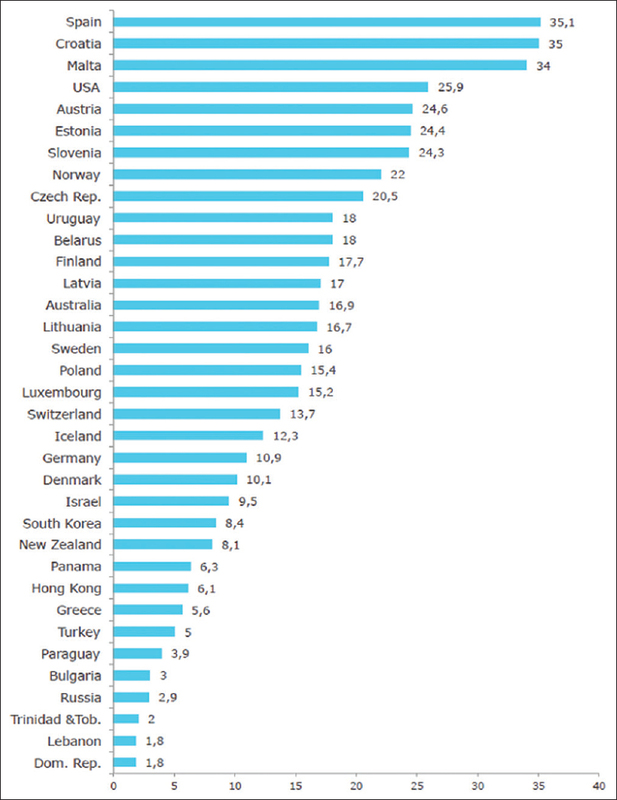 Spain has consistently recorded the highest deceased OD rate of 35.1 donor pmp followed by Croatia, Malta, USA, Austria, Estonia, etc., while many countries across the world have been following Spanish model of ODT to increase ODT activities.,,, With regard to living organ donors during 2013, Turkey recorded the highest living donor rate with 46.6 pmp followed by South Korea (36.5 pmp), Lebanon (27.2 pmp), Iceland (24.7 pmp), and USA (18.8 pmp). During the consultative meet at Madrid 2010, a hierarchical framework of country capacity  was agreed on for ODT, ranging from the lowest (level 1) with no activity to the highest (level 5) of well-developed health system [Table 2]. Developing country like India falls in intermediate stage (level 3). A recent development of last decade (2007) was starting of the global observatory on OD and transplantation. According to latest available (2013) information, approximately 118,127 solid organs were reported to be transplanted across the globe that is roughly 2.98% increase from the previous year. These included kidney (79,325, 67.1%), liver (25,050, 21.2%), heart (6270, 5.3%), lung (4834, 4.0%), pancreas (2474, 2.0%), and small bowel (174, 0.1%). It is estimated that currently organ transplantation covers <10% of the global need. Each day, about 60 people around the world receive an organ transplant, while another 13 die due to nonavailability of organs. Of 194 World Health Organization (WHO) member countries, 57% were engaged in some level of solid organ transplant activities and over a third (36%) reported deceased organ transplantation activity; 62% transplants were performed in high-income member states, while only 28%, 9%, and <1% were performed in upper-middle, lower-middle and low-income member states. The practice of organ transplantation has now diffused across all income strata and has reached the populations of Bangladesh, Kenya, Kyrgyzstan, Myanmar, Nepal, and Tajikistan also. Unfortunately, India with a 1.2 billion population is lagging behind in OD with a national deceased donation rate of <1 pmp; however, Tamil Nadu has shown exemplary performance in OD with 1.3 donor pmp. Although India falls in the second position with numbers of live donor transplants undertaken in the world after the USA, but stand nowhere in the list of deceased donor transplant.,, Country needs 260,000 organs every year; that is, 180,000 kidneys, 30,000 livers, and 50,000 hearts whereas only 6000 kidneys, 1200 livers, and 15 hearts are transplanted annually (National Organ Transplant Program [NOTP]). India has a fairly well-developed corneal donation and transplant program; however, donation after brain death has been relatively slow to take off. In the backdrop of annual requirement of 100,000 corneas, around 40,000 were collected (National Program for Control of Blindness) during past few years yet <25% could be transplanted due to various administrative, technical, and quality issues. Until 2007, there were no set definitions and terminologies of OD and related field. A need for standardization for uniform collection of data and information was felt for the global database on donation and transplantation and resulting collaborative effort of the WHO and Organizacion Nacional de Trasplantes of Spain resulted in ground-breaking spade work. Some of the standard definitions are as follows. Donation refers to donating human cells, tissues, or organs intended for human applications. The donor is a human being, living or deceased, who is a source of cells, tissues, or organs for the purpose of transplantation. An actual organ donor is deceased or living person from whom at least one solid organ or part of it has been recovered for the purpose of transplantation. A2 = Emotionally related: Spouse (if not genetically related); in-laws; adopted; friend. Not genetically or emotionally related. Deceased nonheart beating donor (NHBD) (donor after cardiac death): NHBD: Is a donor who was declared dead and diagnosed by means of cardiopulmonary criteria. Brain death is irreversible cessation of cerebral and brain stem function characterized by the absence of electrical activity in the brain, blood flow to the brain, and brain function as determined by the clinical assessment of responses. A brain dead person is dead, although his or her cardiopulmonary functioning may be artificially maintained for some time. Cardiac death: Death resulting from the irreversible cessation of circulatory and respiratory function; an individual who is declared dead by circulatory and respiratory criteria may donate tissues and organs for transplantation. Transplantation refers to transfer (engraftment) of human cells, tissues, or organs from a donor to a recipient with the aim of restoring function(s) of the body. What Can Be Donated by Humans under What Conditions? Nearly, 25 different organs (kidney, heart, lung, liver, pancreas, uterus, and ovary) and tissues including cornea, eardrum, bone and bone products, blood transfusion, blood vessels, Islets of Langerhans More Details, heart valves, cartilage, bone marrow, hand, face, skin, nerve, and tendon can be donated after medical screening. A donor can live with one kidney and half of the pancreas and in case a person donates three-fourth of his liver, it generates to its original size within 6 weeks. In principle, there is no limitation of age with respect to organ removal including newborns and children.,, Absolute contraindications for OD include viral diseases such as human immunodeficiency virus (HIV), Hepatitis B/C, cytomegalovirus (CMV), Ebola virus (EBV), rabies, syphilis, severe infection/sepsis, active tuberculosis, and progressive malignancy. In a recent development from United States of America, HIV Organ Policy Equity (HOPE) Act of 2013 has been passed that permits HIV-positive individual to donate organs to HIV-positive recipients and utilization of such organs for research purpose. The graft survival and outcome status have been found to be of similar order as in HIV-negative individuals. Hospital infrastructure, logistics, manpower, functional linkage, and support system. Both kinds of donation are now recognized as critical to the capacity of nations to develop self-sufficiency for ODT. Deceased (erstwhile cadaveric heart beating or non-heart beating) donors account for the majority of organ sources, but this source is heavily constrained by the willingness of donation. Recent years have seen a steady increase of living (related or un-related) donors partly due to medical profession's consensus that this option provides a comparative improved medical outcome over deceased donor transplantation. Living donor kidney transplantation is taking on a more predominant role than ever. According to the Donor Nephrectomy Outcomes Research Network, nearly 40% of all kidney transplants worldwide are derived from living donors. Currently, kidneys from living donors account for over 95% in India, 41.5% in the USA, 29% in Scandinavia, while only 8% of transplant in Belgium. In China, nearly 80% of the organs came from voluntary OD after citizens' death in 2014. The waiting time for receiving organ transplantation vary significantly based on severity of illness and other factors e.g. median national waiting time for kidney is nearly 4 years and 1.5 years for liver in United States of America. Most of cadaver transplanted kidneys are obtained from brain dead donors with functional circulation. Brain death can occur due to spontaneous intracranial hemorrhage, head trauma, cerebral ischemia, or primary cerebral tumors. Corneal transplant, simplest of all transplants can be undertaken on retrieval of the cornea from deceased person only. OD can be considered when there is a beating heart which supplies blood and oxygen to the vital organs and this situation can occur in-case of hospital death only. If someone dies outside of the hospital/at the accident site or home, OD is not an option but tissue donation is still possible depending upon time of death. Opt-out-where anyone who has not refused is considered as a donor (presumed consent). In India, we have opt-in system, while many western countries with high organ transplant activities practice opt-out system. The potential donor can also approach OD agencies for a donor card which is available free of cost. During lifetime, a person can pledge for OD by filling up a donor form in the presence of two witnesses, one of whom shall be a near relative. Although not legally binding, the donor card is a means of expressing ones willingness to donate organs and make family more understanding towards the cause. However, the prerogative on the decision eventually rests with the next of kin of the deceased after expressed written consent. If a person expires without registration, the family members can donate his/her organs. For this they need to sign a consent form, which is provided at that time and organs are harvested within a few hours. The family of the donor does not face any difficulty or extra burden upon them. The transplant coordination team carries out the entire process till the relatives receive the body of the deceased. The deceased body is given back to the family in a dignified way with no disfigurement. The body can be viewed as in any case of death and funeral arrangements need not be delayed. Living donation entails undertaking formalities with transplant centres directly. Xenotransplant: When transplantation is performed between different species e.g., animal to human. Transplant care and follow-up [Figure 2]. The cost of organ transplant varies across the globe, but most common kidney transplant can range from as low as $5,000 (India), $70,000 (China) to $100,000 (USA). Another recent report is referring to estimated billed cost per member per month in the USA depicts that transplantation is indeed a costly affair cornea ($28,000), kidney ($300,000) and liver ($700,000). Even in the government sector in India, the renal transplant may incur personal expenditure ranging from Rs. 50,000/- to Rs. 100,000/- depending on the availability of sophisticated investigations; cornea (Rs. 8000/-), liver transplant (AIIMS, New Delhi: Free of cost; PGI Chandigarh: Rs. 7/-–Rs. 8/-lakhs, ILBS New Delhi: Rs. 12/-–Rs. 14/-lakhs) while in private sector renal transplant may range from Rs. 3.5 lakh to 15 lakh depending on compatible or non-compatible blood group transplant; cornea (Rs. 35,000/-–Rs, 65,000/-), liver (Rs. 18–30 lakh), and heart transplant may cost ranging from Rs. 10 lakh to Rs. 20-lakhs (Times of India). Contrary to general perception, the long-term cost of renal transplantation is lower compared to hemodialysis or peritoneal dialysis., Even the quality of life and survival are reportedly better among renal transplant recipients. Survival outcome is dependent on many factors such as status of disease pathology/concomitant illness, operative risk, graft rejection, infection, posttransplant care, nutrition, adverse effects of immunosuppressive therapy, and very small additional risk of malignancy development. The patient and graft survivals are similar with donation after circulatory death as compared to conventional deceased donor transplantation. Five-year survival rates for most organs are now at least 70%. More than 1 million people worldwide have received an organ transplant, and some have already survived more than 25 years. The top runners in patient survival are recipients of live-donor kidneys, with 95% surviving for at least 1-year and 65% for 10 years, heart and liver recipients have survival rates of 85% for 1-year and 70% for 5 years. Lung recipients show similar results at 1-year but only 55% surviving beyond 5 years [Figure 3]. An ambitious start was made with announcement of NOTP in the year 2009; however, its current budget has been scaled down to one-tenth of the initial proposal due to other present and clear challenges with the onus now on states to take leadership in ODT activities. National Organ and Tissue Transplant Organization (NOTTO) situated at Safdarjung Hospital, New Delhi has been commissioned and has two divisions: (1) National Human Organ and Tissue Removal and Storage Network (2) National Biomaterial Centre (National Tissue Bank). Regional/State level organ and tissue transplant institutions would be established in a phased manner at Kolkata, Chennai, Mumbai, Chandigarh, and Guwahati in addition to six cities where AIIMS are established. The NOTTO website has become functional and operational guideline of NOTP has been released in 2015. A call center is being set up which will set up contact between donors and people in the waiting list, on a real-time basis. Indian OD day is observed every year, since 2010. Department of Health Research under the government of India is boosting funding for research activities including molecular and transplant immunology, stem cell, and genomics. With the objective of learning, sharing, and emolliate best practices in ODT, a memorandum of understanding is expected to be signed with Spain. Many of such practices though have been articulated and reflected in the legislation and executive orders; however, these need to be implemented in an environment of mutual trust in letter and spirits. Country has well developed accredited training system for capacity building of health workforce. Tamil Nadu is the model state for ODT in India with OD of 1.3 pmp (India: 0.05–0.08) because of mandatory executive actions, public-private partnership, good coordination and added facilities, the number of cadaveric transplant increased drastically in the last decade., This model also takes care of the poorer section of society by conducting ODT through government run public facilities free of cost. Other leading states in ODT activities are Delhi, Andhra Pradesh, Kerala, Karnataka, Gujarat, Maharashtra, and Uttar Pradesh. Available details of solid organ transplant undertaken by selected states during last decade are shown in [Table 3]. Pioneering work has been undertaken by large number of Nongovernment Organizations (NGOs) such as Multi Organ Harvesting Aid Network, Chennai; Foundation for Organ Transplantation and Education, Bangalore; Delhi Organ Procurement Network and Transplant Education, Delhi; Organ Retrieval Banking Organization, New Delhi; and Deceased Organ Retrieval Sharing Organization, Delhi in contributing immensely on community and health staff awareness, training of transplant coordinator, monitoring, evaluation, and coordination. Selected list of government agency/active NGOs is shown in [Annexure 1] with their website. Government of India through various institutions/agencies undertakes specific OD awareness generation activities including release of postal stamp. National Program for Control of Blindness (NPCB) under the government of India, observes eye donation awareness fortnight from 25th August to 8th September every year throughout the country with the help of state authorities and NGOs. Recently, social and print media have started undertaking online awareness generation activities; 13th August is being observed as OD day. Successful OD by deceased family member is highlighted as case-study in various media. Various studies conducted in India indicate reasonably high awareness on organ/tissue donation. However this heightened awareness is not getting translated into actual donation, probably motivation/training of health personnel is also required along with appropriate linkage. Since health is a state subject, there is no central collation of data with regard to solid ODT; however, the government of India is planning to start online-registry. Indian transplant registry started in the year 2005 by the efforts of the Indian Society of Organ Transplantation  and provides a fair collation and reflection of data of participating center on trend, state, and gender related information of kidney and liver transplant. NPCB provides funds to states/NGOs for corneal disease management, training, development of eye-banks/eye donation center, and salary component of grief (eye) counselor, hence there is central collation of data related to corneal donation., There were 400 eye banks in India at one point of time; however, due to non-donation of corneas/eyes after death, significant proportion have become nonfunctional with only 250 at present. The majority of solid organ transplants done in India are living related or unrelated transplants with approximately 200 transplant centers in the country mostly led by private players and NGOs. Detailed procedures regarding quality assurance, donor screening, qualification and experience of doctor/transplant coordinator, laboratory investigations, equipment, documentation, other requirements, etc., should be notified. At any given time, every major city would have 8–10 brain dead patients in various ICUs with 4–6% of all hospital deaths being brain death. In India, road accidents account for around 1.4 lakh deaths annually and of these almost 65% sustain severe head injuries as per a study carried out by AIIMS, Delhi, meaning that there are almost 90,000 patients who may be brain dead. It is not that people do not want to donate, but that there are no mechanisms in hospitals to identify and certify brain deaths. It may also be pertinent to mention that no one empowers the relatives of a brain dead person to save lives of other people by donating their relative organs. Most importantly young deaths occurring either due to road traffic accidents or cardiovascular phenomenon provide the best option of yielding high quality organs but also requires air and road linkage (popularly known as dedicated green corridor) with appropriate trauma and transplant hospitals. There is no second thought that there are other imminent public health challenges being faced by country and ODT may not receive priority attention in the current socioeconomic and political scenario. However, with each passing day, growing need and demand, technological advancement, and spirits are taking this movement forward. In our opinion, the day is not far off in future when WHO declares OD as a theme for World Health Day (7th April) to generate global interest, awareness, and preparedness. To conclude, in an environment of flexible bureaucratic procedures, system readiness, technical know-how, and abundance of organs linked with high motivation, positive attitude of health staff, transparent communication, counseling and functional coordination of different institutions/units will lead the graph reversal from low to high ODT activities in India and may offer another functional model to the world. Dean, North Delhi Municipal Corporation Medical College and Hindu Rao Hospital, Delhi - 110 007 for constant encouragement, advice, and guidance. Muehlbacher F. Historical development, regulation, results, availability and access. Transplantation 2009;88:S126. Bergan A. Ancient myth, modern reality: A brief history of transplantation. J Biocommun 1997;24:2-9. Linden PK. History of solid organ transplantation and organ donation. Crit Care Clin 2009;25:165-84, ix. Barker CF, Markmann JF. Historical overview of transplantation. Cold Spring Harb Perspect Med 2013;3:a014977. Durst A. An overview on organ transplantation. Assia Jew Med Ethics 1997;3:7-10. Chapman JR. What are the key challenges we face in kidney transplantation today? Transpl Res 2013;2 Suppl 1:S1. Garcia-Garcia G, Harden P, Chapman J. The global role of kidney transplantation. Indian J Nephrol 2012;22:77-82. Matesanz R, Domínguez-Gil B, Coll E, de la Rosa G, Marazuela R. Spanish experience as a leading country: What kind of measures were taken? Transpl Int 2011;24:333-43. Matesanz R, Miranda B. A decade of continuous improvement in cadaveric organ donation: The Spanish model. J Nephrol 2002;15:22-8. Matesanz R. Factors influencing the adaptation of the Spanish Model of organ donation. Transpl Int 2003;16:736-41. Matesanz R, Domı´nguez-Gil B. Strategies to optimize deceased organ donation. Transpl Rev 2007;21:177. Report of the Madrid Consultation: Part 2: Reports from the working groups. Transplantation 2011;91 Suppl 11:S67-114. Global Observatory on Donation and Transplantation. Available from: http://www.transplant-observatory.org/Pages/home.aspx. [Last accessed on 2015 May 30]. White SL, Hirth R, Mahíllo B, Domínguez-Gil B, Delmonico FL, Noel L, et al. 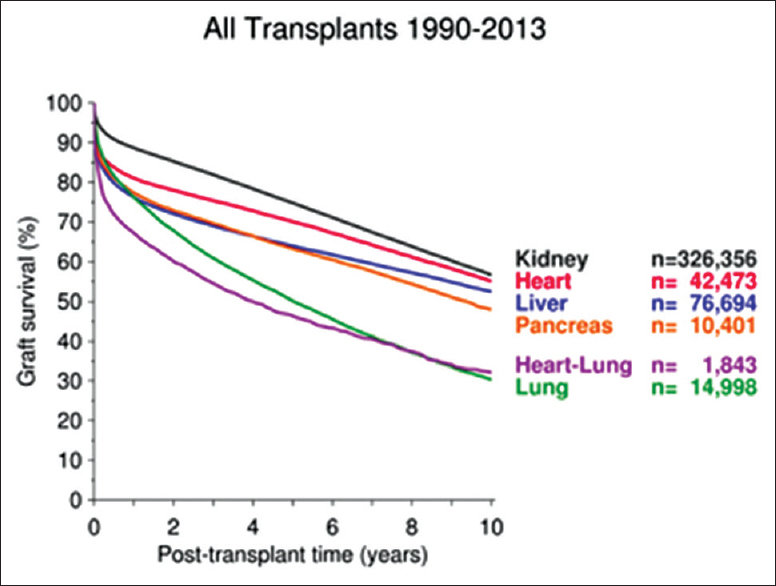 The global diffusion of organ transplantation: Trends, drivers and policy implications. Bull World Health Organ 2014;92:826-35. Shroff S. Legal and ethical aspects of organ donation and transplantation. Indian J Urol 2009;25:348-55. Chugh KS. Five decades of Indian nephrology: A personal journey. Am J Kidney Dis 2009;54:753-63. Executive Summary of National Round Table on Organ Donation from Deceased Donors. King George Medical University, Lucknow; 2014.
WHO. 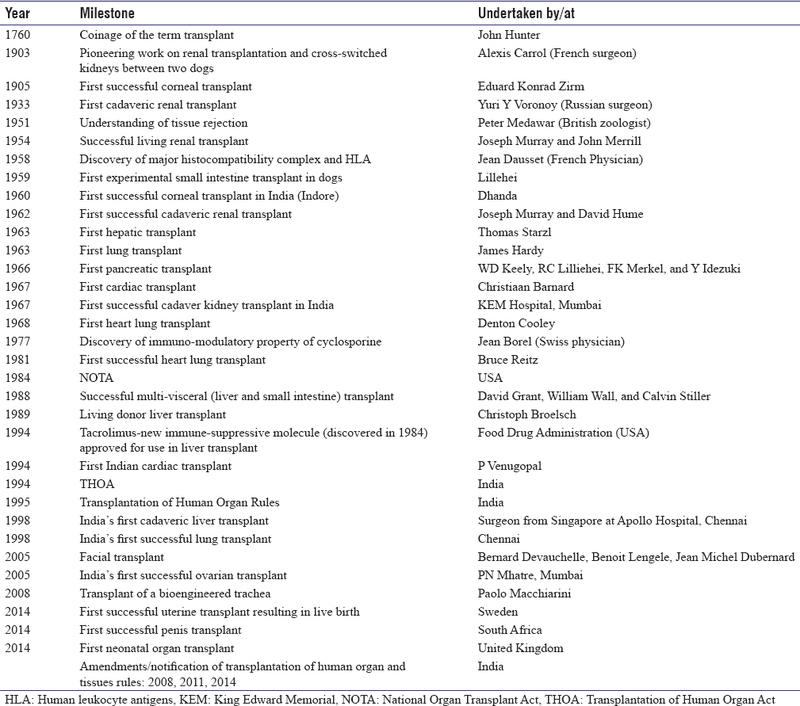 Global Glossary of Terms and Definitions on Donation and Transplantation. Geneva: WHO; 2009. Meeting the Organ Shortage. Current Status and Strategies for Improvement of Organ Donation. A European Consensus Document. Available from: . [Last accessed 2015 Jan 22]. 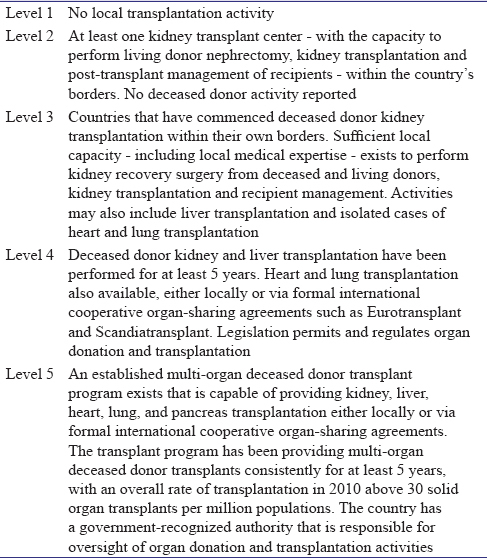 Schaupp W. Legal considerations of organ donation in various countries. Transplantation 2009;88:S126. Organ Donation. Available from: http://www.mohanfoundation.com. [Last accessed on 2015 Jan 22]. HOPE Act to Facilitate Organ Recovery from HIV-Positive Donors. United Network for Organ Sharing, News: May 7, 2015. Available from [Last accessed on 2015 May 30]. Oliver M, Woywodt A, Ahmed A, Saif I. Organ donation, transplantation and religion. Nephrol Dial Transplant 2011;26:437-44. Alkhawari FS, Stimson GV, Warrens AN. Attitudes toward transplantation in U.K. Muslim Indo-Asians in west London. Am J Transplant 2005;5:1326-31. NHS Blood and Transplant: Hindu Dharma and Organ Donation. Available from: . [Last accessed on 2015 Jan 25]. Veerappan I. Deceased donor kidney transplantation in India. Heal Sci 2012;1:JS010. Boyarsky BJ, Massie AB, Alejo JL, Van Arendonk KJ, Wildonger S, Garonzik-Wang JM, et al. Experiences obtaining insurance after live kidney donation. Am J Transplant 2014;14:2168-72. Sood P, Hariharan S. Incentivization of living donation: Is it time to cross the bridge? Am J Kidney Dis 2014;64:484-5. Mishra PH, Vij A, Sharma RK. A knowledge, attitude and practice study of organ donation and its problems in the metropolitan City of Delhi. J Acad Hosp Admin 2004;16:1-6. Khashu RD, Dar SK. People's perspectives: Insights into organ donation from brain stem dead donors. J Hum Soc Sci 2014;19:70-6. Dar R. Challenges of organ donation from brain stem dead persons in India. Nurs J India 2014;105:105-7. Topbas M, Can G, Can MA, Ozgün S. Outmoded attitudes toward organ donation among Turkish health care professionals. Transplant Proc 2005;37:1998-2000. Woo KT. Social and cultural aspects of organ donation in Asia. Ann Acad Med Singapore 1992;21:421-7. Jose R, Sachdeva S. Keeping an eye on future: Medical tourism. Indian J Community Med 2010;35:376-8. Goyal M, Mehta RL, Schneiderman LJ, Sehgal AR. Economic and health consequences of selling a kidney in India. JAMA 2002;288:1589-93. Budiani-Saberi DA, Delmonico FL. Organ trafficking and transplant tourism: A commentary on the global realities. Am J Transplant 2008;8:925-9. Ghods AJ. The history of organ donation and transplantation in Iran. Exp Clin Transplant 2014;12 Suppl 1:38-41. Broumand B. Transplantation activities in Iran. Exp Clin Transplant 2005;3:333-7. Shimazono Y. The state of the international organ trade: A provisional picture based on integration of available information. Bull World Health Organ 2007;85:955-62. Chen YH. Tens of thousands of foreigners coming to China for organ transplantations: An investigation. Phoenix Wkly 2006;5:2-6. Huang J, Mao Y, Millis JM. Government policy and organ transplantation in China. Lancet 2008 6;372:1937-8. Huang JF, Wang HB, Zheng SS, Liu YF, Shi BY, Shen ZY, et al. Advances in China's organ transplantation achieved with the guidance of law. Chin Med J (Engl) 2015;128:143-6. Chkhotua AB, Klein T, Shabtai E, Yussim A, Bar-Nathan N, Shaharabani E, et al. Kidney transplantation from living-unrelated donors: Comparison of outcome with living-related and cadaveric transplants under current immunosuppressive protocols. Urology 2003;62:1002-6. Horvat LD, Shariff SZ, Garg AX; Donor Nephrectomy Outcomes Research (DONOR) Network. Global trends in the rates of living kidney donation. Kidney Int 2009;75:1088-98. 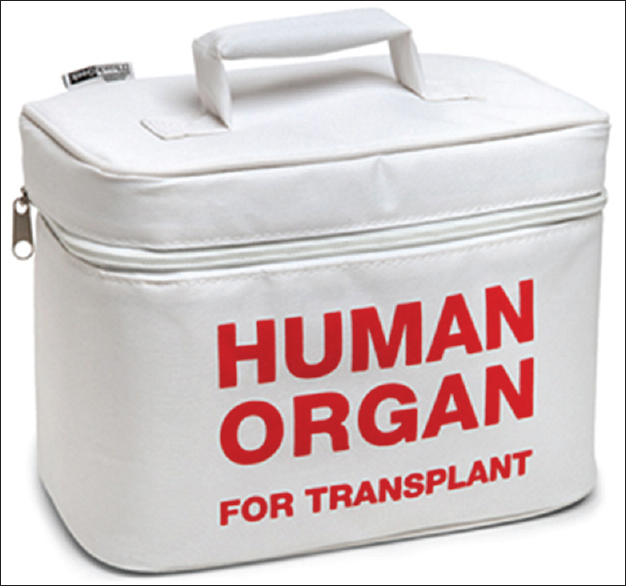 Looze KD, Shroff S. Can presumed consent overcome organ shortage in India? Lessons from the Belgian experience. Natl Med J India 2012;25:168-71. Statistics of Organ Donation. Administration COD; 2014. Available from: http://www.chinaorgandonation.org.cn. [Last accessed on 2015 Feb 18]. Robert Walsh. Federal oversight of organ procurement and transplantation. HHS and HRSA: Centre for Disease Control. Available from [last accessed 2015 Feb 18]. Organ donation process. ORBO: AIIMS, Delhi. Available from http://www.aiims.edu/aiims/orbo/process.htm [last accessed on 2015 Feb 2]. Organ Transplantation. Wikipedia. Available from: http://www.en.wikipedia.org/wiki/organtransplantation. [Last accessed on 2015 Jan 25]. Bentley TS. US Organ and Tissue Transplant Cost Estimates and Discussion: 2014. Milliman Research Report, USA; 2014. Abraham G, Jayaseelan T, Matthew M, Padma P, Saravanan AK, Lesley N,et al. Resource settings have a major influence on the outcome of maintenance hemodialysis patients in South India. Hemodial Int 2010;14:211-7. Jensen CE, Sørensen P, Petersen KD. In Denmark kidney transplantation is more cost-effective than dialysis. Dan Med J 2014;61:A4796. D'Alessandro AM, Fernandez LA, Chin LT, Shames BD, Turgeon NA, Scott DL, et al. Donation after cardiac death: The University of Wisconsin experience. Ann Transplant 2004;9:68-71. Collaborative Transplant Study. Outcome Data of Participative Centers. Available from: [Last accessed on 2015 Apr 12]. World Transplant Games Federation. Available from: . [Last accessed on 2015 Apr 15]. Transplant Games of America. Available from: . [Last accessed on 2015 Apr 27]. National Organ and Tissue Transplant Organization (NOTTO). Available from: . [Last accessed on 2015 Mar 1]. Department of Health Research. 12th Five Year (2012-17) Plan Document, Government of India, New Delhi; 2012. MoU with Spain on Organ Transplantation Soon. Press Information Bureau, Government of India: 31st October, 2014. Available from: . Cadaveric Transplant Program, Government of Tamil Nadu, Tamil Nadu Network for Organ Sharing. Available from: . [Last accessed on 2015 Feb 20]. Abraham G, Reddy YN, Amalorpavanathan J, Daniel D, Roy-Chaudhury P, Shroff S, et al. How deceased donor transplantation is impacting a decline in commercial transplantation-the Tamil Nadu experience. Transplantation 2012;93:757-60. State and Year Wise Information on Transplantation in India. Available from: . [Last accessed on 2015 May 19]. Shroff S. Indian transplant registry. Indian J Urol 2007;23:272-7. National Program for Control of Blindness. Available from: . [Last accessed on 2015 Feb 12]. Jose R, Sachdeva S. Eye Banking in India. J Postgrad Med Educ, Train and Res 2008;3:14-7. Promotion of Organ Donation. Press Information Bureau, Government of India. Available from: . [Last accessed on 2015 Mar 25]. Transplantation of Human Organs Act. Press Information Bureau, Government of India, Ministry of Health and Family Welfare. Available from: . [Last accessed on 2015 Mar 25]. Amendments in Transplantation of human organ Act, 1994; November, 2009 (Release ID: 54299). Press Information Bureau, Government of India, Ministry of Health and Family Welfare. Available from: . [Last accessed on 2015 Mar 25]. Organ Donation and Transplantation Provides Second Life. Press Information Bureau, Government of India, Ministry of Health and Family Welfare. Available from: . [Last accessed on 2015 Mar 25].